Representatives of the Special Olympics Ireland participate in the 'Peoples Parade' ahead of the main St Patrick's Day Parade in Dublin. GOVERNMENT FUNDING HAS been approved for a new €5 million headquarters for Special Olympics Ireland at the National Sports Campus. The organisation says the move will result in ‘significant savings for the programme’. CEO Matt English said it was a long-term solution to a range of on-going accommodation problems for Special Olympics. The building, to be built at Abbottstown in Dublin, will provided a base to support programmes for over 9,000 athletes across Ireland. “It is a fitting tribute to all our athletes with an intellectual disability and the volunteers who work with them that the headquarters of their organisation can take its rightful place alongside the other national governing bodies of sport on the island whose headquarters are located on the National Sports Campus”, English said. 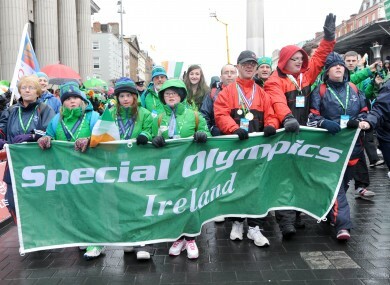 The 2014 Special Olympics Ireland Games will take place in Limerick this June, part of the city’s designation as the National City of Culture 2014. Organisers are expecting more than 4,000 participants and 70,000 spectators. Email “New €5m headquarters for Special Olympics will 'yield significant savings'”. Feedback on “New €5m headquarters for Special Olympics will 'yield significant savings'”.